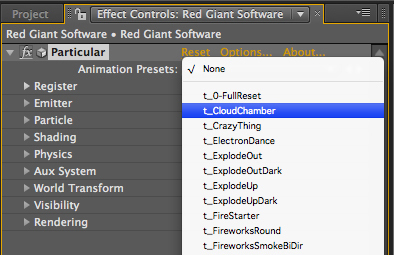 Some of our After Effects products use Animation Presets (i.e. Trapcode Mir, Trapcode Tao, Magic Bullet Mojo, as well as legacy versions of Particular and Form) and included below are some helpful steps to take if these aren't appearing for you. 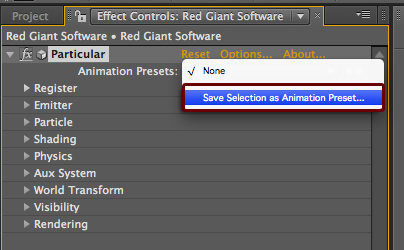 After Effects by default has the Effects & Presets Window turned off to the user so this is the most common reason for Animation Presets to not appear and the solution is as easy as just turning on this Window in After Effects. This example shown is with legacy Trapcode Particular, however, the process is the same for all products that use Animation Presets. 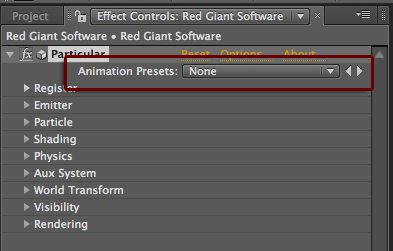 If you do not have an Animation Presets menu as picture below, enable this menu by clicking the Effects Controls panel menu. 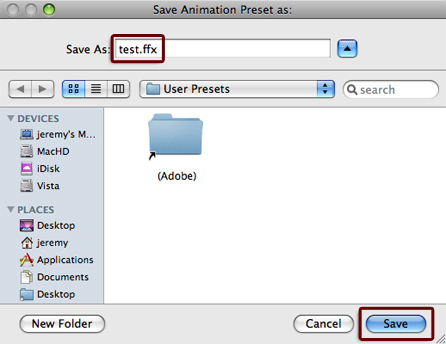 The next steps will give you a few methods for initializing your Animation Presets. First, we will try to make them appear by reloading the Effects & Presets panel. If this doesn't work, Step 3 describes an alternative method. 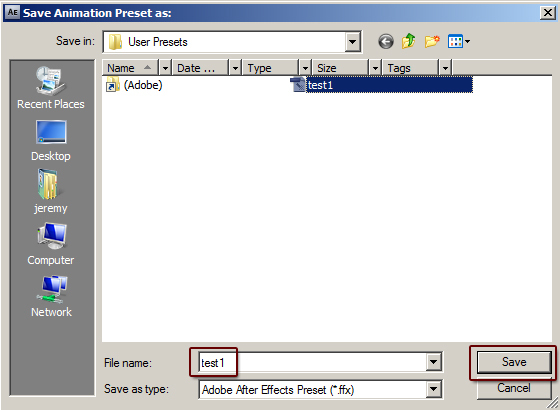 If Effects & Presets window is not enabled, go to the Window menu and choose Effects & Presets. This will open the Effects & Presets panel and depending on your workspace will typically appear on the far right side of After Effects. Click on the Effects & Presets panel menu in the upper right corner of the panel, then choose the Refresh List option at the bottom. This will force After Effects to reload the .ffx in all locations and should make the Animation Presets appear in their pop-up menu. 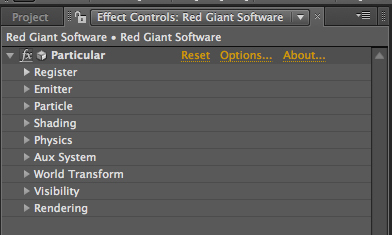 Tip: To save yourself from performing these steps again, keep the Effects & Presets window open when you close After Effects and when you reopen After Effects all of your Animation Presets will automatically be loaded. 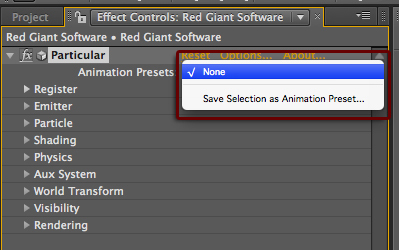 Save a Custom Animation Preset. 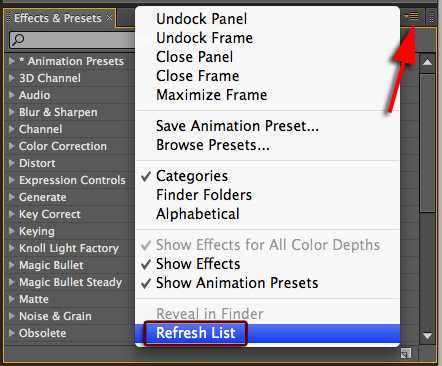 If your Animations Presets still have not appeared by performing the steps outlined above, try saving a custom preset. Doing so will force After Effects to reload all the .ffx files. Give this preset a name and click Save. 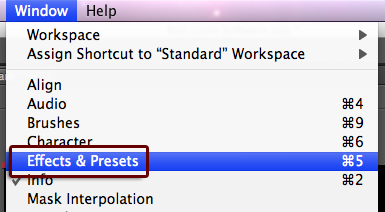 Next, in the plug-in’s Effects Controls, click the Animation Presets menu. All of the presets should appear. If you are still unable to get your presets to load in After Effects, please ensure that all Sharing & Permissions privileges for the plug-in's Preset folder and all .ffx files (MacHD/Applications/After Effects/Presets/) are changed to 'Read & Write' for all Administrators and Users on the system and you may leave the ‘Everyone’ Name in Sharing & Permissions set to 'Read Only' by default. Note: We do not recommend correcting permissions on system folders such as: MacHD, /Library, /Application Support, ect..